I am watching snow fly upward. We are staying home today under a blizzard watch, and I’m watching my own little blizzard right now while everyone else sleeps. Thank you all for your thoughtful comments yesterday. I cannot tell you how gratifying it is to me to learn there are so many other people out there with an itch to dig! Dig, and maybe blog about it! When I started this blog endeavor, indeed, when I started this grow-most-of-what-we-eat thing, it was a rather solitary pursuit. It still is a solitary pursuit, come to think of it; it’s my muscle, my rather like-it-or-lump-it decisions as far as what is grown and what is cooked and what gets preserved for later. But to know that I am part of a community, at least a virtual one, is good for me on a cold day like today. So thank you, kind readers. It’s cool that we can share the experience of being snowed in, through an internet connection! haha. How can you be having a blizzard?? If the snow is flying upwards then it gets stuck to the clouds and just passes over, doesn’t it? Therefore no snow on the ground! Sometimes I think I don’t understand physics all that well! Seeds – this year I’ve taken time to do it right. Made up a seed ordering chart like the one that Mike showed over at TinyFarmBlog (though simpler) and it really helped me do a better job of planning my garden. Like I didn’t really need 50 linear feet of bush (green) beans – not for just the two of us!! So now I will look over today the seeds left from last year and then decide what to order. Okay, I’ve come out of the closet. 🙂 I’ve been reading you for a while now, and I’ve read pretty much every post (including the previous incarnation of the blog). Sorry for your blizzard. We’re in a state that’s a warmer color and climate than yours. Even so, we’re envious. At least you’re getting precipitation that melts slowly into the soil; we’re in deeply desperate drought, the worst in the nation. 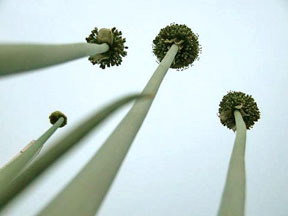 Even so, I have nine lovely heads of broccoli out in the yard! From your previous post — let me plead that the flowers are more a necessity for us than for you. You live in the country and, I perceive, a less sterile environment. I saw a bee buzzing around our snap peas last week and just about fell over. Here, trapped for the moment in suburbia, I have to pull out all the stops to make sure we have pollinators, or I’ll have to pollinate the melons and okra again next year. We strongly desire to follow a great deal of your path — you have posted in this blog a lot of lessons we can learn from as we do. Thank you. I plan to bug you a lot. I wish your blizzard could have blown a few flight delaying flakes into NJ. I spent the flight home choosing my seeds for this year. And reliving cute grandchildren moments. This made me think of the Charlie Brown musical, that song where Lucy is telling Linus how different things in the world “work”. One line goes, “and when its cold, and winter is upon up, the snow comes *up* just like the flowers” – LOL! Charlie Brown bangs his head at that, but I can see how it looks ike that! Hope you made it through the blizzard ok – with sights like this, its hard to remember spring will ever come. Mark, hah! So true. I sometimes think we should have a state motto that goes Michigan: You Better Like Winter. Hey Zandt, bug away! And really, I should re-recommend both calendula (which will bloom for you most of the winter) and borage if it’s bees you’re after. Other great pollinator magnets are angelica and bee balm: on my angelica last year I swear I saw at least 15 types of bugs from flies to bees to moths one day. And yes it is more helpful if the bugs do the pollinating for you; I can’t imagine moving around a big bush of prickly okra is anyone’s idea of fun, even if the flowers are so pretty. Good luck getting on with the grand life plan, though. I do love it out here and it is a completely different life, even if I was a crazy gardener and canner and food-storer in the city. It’s still much more of a life spent outside here, and that’s a good thing! MC, what a funny memory. Personally, I am very locked in to the idea that it is Winter and ever shall be for months yet. (It’s April that’s the most heartbreaking!) But thank you; we’re looking forward to sledding lots this weekend. Safira, well, yeah; we’re kind of like Buffalo in terms of getting hit by snow from the lake effect (and actually I don’t complain at all because 45 mins east of us in Kalamazoo they really get socked in, and it’s lots colder to boot). But certainly good luck with any travels this weekend! Little Edie is definitely spoiled; she lasted all of 20 minutes outside before insisting to come back in, so yeah, even our barn cat is getting a bit too pampered. But she *did* kill the one vole I had in the greenhouse on Monday~! Safira – Global weirdness is exactly what global warming means. Not a gentle blanket being pulled snugly around the earth, making all places warmer, but radical changes in weather patterns. Previously, we in Wisconsin had realtively warm winters. Last year and this we’re having very cold winters followed by very wet springs: So Wisconsin had really unprecedented flooding from rain falls on top of an exceptionally deep snowfall. Then we suffered thru a summer-long drought. This type of thing is happening more often around the world. It ain’t going to be pretty for our kids and grandkids. You take care now…blizzards are NOT any fun. I must say that I really do enjoy coming here so thanks for letting us into your life. Blizzard and all. Oh look at that poor little kitty! I love sharing my pets from the garden too. We are in the middle of a horrible winter too. Stay warm dear garden friend – you have some fabulous work on this blog. THANK YOU FOR SHARING!!! Dennis, yeah, I think Safira has read her Thos. Friedman too. Personally I think he’s a bit of a johnny-come-lately to the whole climate-change issue but hey everyone will wake up to it sooner or later, and at least Friedman has enough of an audience to convince a few more doubters. I neither doubt his sincerity nor the zeal that he shows as a new convert. Nor do I doubt yours or anyone else’s, this is a much bigger issue even than the financial pickle we find ourselves in. One way to slow warming down of course IS to grind the world economy and production down to zero…but do we want to go there? I don’t. Thanks, Linda! Yep believe it or not we’re now under a NEW blizzard warning. Oh well. We’re warm as toast here in our chilly house, and of course it’s days like this that it’s fun to get the oven going with fattening edibles. Why thank you, Bren. I am glad I can share, it’s fun to do so, and again it’s so fun to learn of more and more folks like you!